A girl and her cleaver. A magical moment. Did I mention that it was my birthday? I did, didn’t I? Well, another of the great gifts I got was this great cleaver. A knife is a cook’s best friend and a good cleaver is brilliant for all your chopping and crushing needs. For many years I had a favourite cleaver, one that my mum bought from a highly entertaining street vendor as part of a complete set of kitchen knives, super-sharp and very cheap. The cleaver and I made friends immediately. Such a handy blade, with complete clearance for the knuckles. The edge perfect for chopping and the side if the cleaver perfect for crushing. But that, the cleaver of my youth, was, as I realised years later when I wrapped it in newspaper, stuck it in my hold luggage and imported it to Scotland, was really quite flimsy and insubstantial. I stopped using it, eventually, feeling let down that it didn’t measure up to my memory of it. Over the last three years I have been reminded of my first knife love when I’ve bumped into the representatives for Kin, makers of very expensive and totally gorgeous Japanese knives. I’m never going to buy one of those, they are objects of desire that I enjoy playing with at food shows and looking at on the web. But I now have a well-balanced, sharp and sturdy cleaver that I can use to chop onions or crush garlic without mashing my knuckles against the chopping board, and without having to worry about the thin steel breaking. Not everyone likes a cleaver. Whether you do depends very much on how you want to use your blade. My knife skills are… questionable. I rarely cut myself but I find it difficult to curl my fingertips in and use my fingers to set the slice width. Most blades seem to narrow for me. And I’m not a particularly fuzzy cook – you won’t ever see me skin a grape, or make a carrot net, but I chop both roughly and finely, and i cut everything from hard vegetables to soft, feathery herbs. I like a large blade. A large blade helps me crushing, mashing and mushing (technical terms for how you treat ingredients in spice pastes), it protects my knuckles and my fingertips, I can use it to scoop ingredients up when chucking them into a pan or pot. It is brilliant. 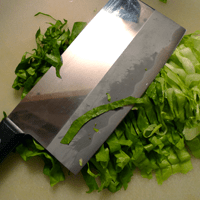 I have never seen the point of a paring knife – which says more about my cooking style than the need for different blade sizes in a normal kitchen – but a cleaver is a beautiful, ever useful thing. Do you have a favourite size of blade or do you use different sizes for different tasks?